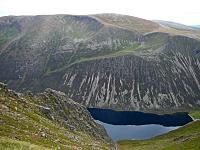 The steep craggy slopes of Braeriach form the N and W walls of Coire Bhrochain, and the summit lies almost on the edge. The broad summit plateau is surrounded by steep slopes and crags. 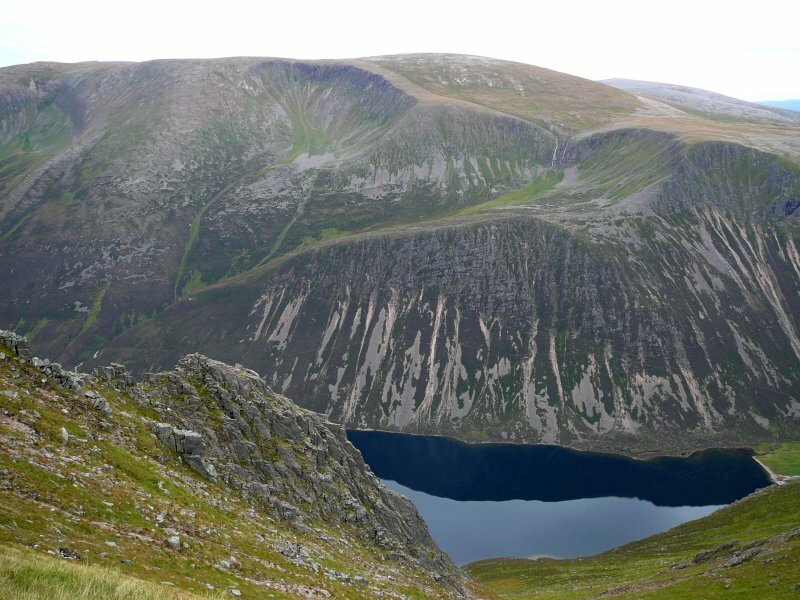 To the E its steep rocky slopes form the western wall of a deep glen, the Lairig Ghru. 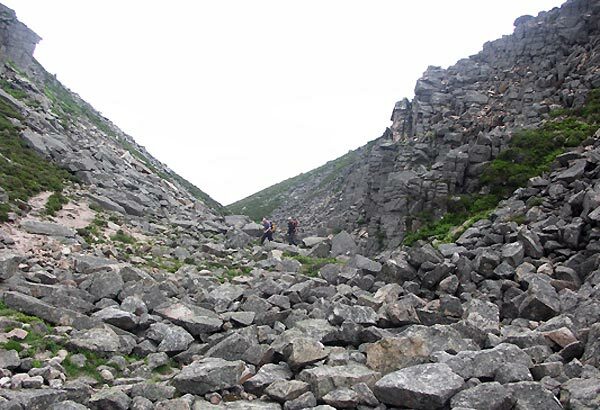 Ascent is not recommended from either of these directions, as there are easier routes from the N-E and the W.
The north-east approach is from the Cairn Gorm approach road through the Chalamain Gap and onto Sron na Lairige, following a well worn path. 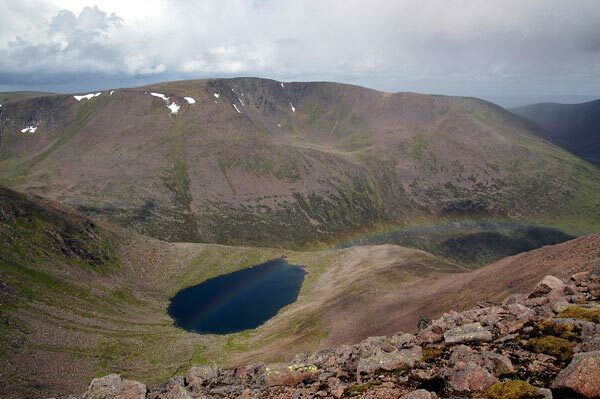 Braeriach can also be approached from Glen Feshie or Gleann Einich in the W or from Sgor an Lochain Uaine to the S following the western rim of An Garbh Coire. Braeriach's southern aspect from Cairn Toul. Last of the winter snows, 13th May 2006. 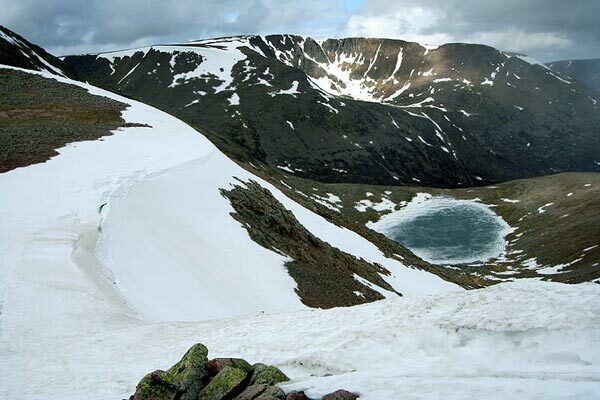 The summary information of one or more ascent routes that include Braeriach. 1 1326 m 20.68 km 6.5 hrs Braeriach A relatively long route route, though not particularly strenuous( only 1000m ascent over 6h), mainly on well trodden paths with wonderful views down the Lairig Ghru. 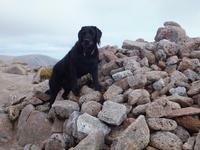 The Wee Black Dug ticks off her last Cairngorm summit. ;) September 2014. 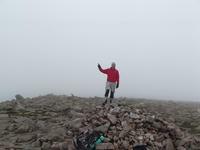 Summit of Braeriach at last, third time lucky!! 1st time not feeling well 2km from summit, 2nd time a member my party was too tired to continue about half way up, so this time, I just blasted it, 2hours 53mins to summit! Post a few words about Braeriach or read what others have had to say. Climbed on 4/7/08 from Derry Lodge. Brilliant day. Shimmering heat haze in Larig Ghru. Via Cairn Toul and Briariach tops & to Sron na Larige. Return S to flat bealach S of Sron na Larige and descend carefully into Larig. There is a faint un-mapped path that is readily followed. BUT be VERY, VERY careful on snow band in highest 100m. Its VERY steep and even in hot July sun the snow was too hard to kick reliable steps into. Descend snow band ONLY with crampons etc. But snow band easily turned to its north and would be to its south. A few helicopter bits on way down. 35 mins to reach Larig Grhu. Despite the fact that we did this in Mid summer the weather was a bit of a nightmare! The first snow fell at around 1000m, and it got worse from there! By the time we got to the top the snow was drifting and falling continuously blown by a strong wind. Had earlier considered going on to complete Angels Peak & Cairn Toul but the weather changed our minds. Perhaps just as well, as we had forgotten how far we had come, and still had to get back! Dropping down into the Lairig Ghru, and climbing back up to Chalamain gap was a real killer! 7 hours 30 mins round trip. We started at the sugar bowl car park. It's a lengthy walk in! We left the car at 11ish and reached the foot of the Sron na Larige at about 1 (though we did mess around in the Chalamain Gap for a while). Ascent up the Sron na Larige allows for good views towards Cairn Lochain and Sgor Gaoith. In poor visibility finding the summit of Braeriach requires good navigation. The summit cairn was possibly hidden under snow. We stood at what we believed to be the highest point along the corrie rim. Didn't get back to the car until 7.20. Bike from whitewell, good track to the loch...up stalkers path to plateau, on to Sgor an Lochain Uiane, then followed corrie edges round to Braeriach...due west took me to Coire Bogha-clioch then steeply down to bike...easy ride out...a good round circuit. 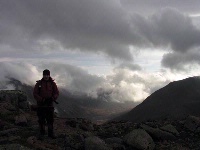 We climbed the route (20/06/2002) and low cloud closed in on our approach to the summit. In poor visibilty the rule is "stick to the path" It does take you to the summit. After 1300hrs the cloud base lifted and we were rewarded with some good views. A moderate climb and as they say, a good day out.